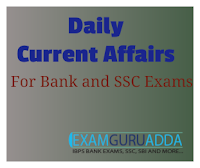 Dear Readers, we are presenting Daily Current Affairs for All Exams- 10th December 2016. 1. China launched a new cargo service connecting Tibet and Nepal. On the occasion of the launch, dozens of trucks carrying goods worth 2.8 million dollars left the Tibetan border port of Gyirong en route to Kathmandu. 2. The trucks are responsible for the remaining 870 kilometre of the journey, carrying goods to Gyirong and then to the final stop in Kathmandu, Nepal's capital. 3. Besides, a train carrying several products like clothes, shoes, furniture, hats, appliances, electronics’ and building materials travelled the 5200-kilometer distance between Guangzhou, the capital of Guangdong Province, and Xigaze in Tibet. 4. The new rail and road cargo service that connects Guangdong, Tibet and Nepal, was launched with the objective to enhance trade with the South Asian neighbour in line with China's Belt and Road (Silk Road) initiative. 1. Japan’s space agency (JAXA) successfully launched a Kounotori 6 (HTV-6) spacecraft that will deliver a large magnetic tether, a space junk collector technology into orbit. 2. The spacecraft was launched on board of H-IIB rocket from Tanegashima Space Center. It was also carrying essential supplies for International Space Station (ISS). 1. The Committee on Digital Payments headed by Ratan P. Watal has submitted its final report to the Union Finance Ministry. It was 11-member committee notified in August 2016 by the Finance Ministry. 2. It was tasked to review existing payment systems in the country and recommend appropriate measures for encouraging Digital Payments. It was having representatives from Reserve Bank of India (RBI), Unique Identification Authority of India (UIDAI), tax department and various industry bodies in the payments space. 1. The Union Ministry of Electronics and Information Technology (MeitY) has launched a TV channel named ‘DigiShala’ to promote cashless transactions. 2. The channel was launched as part of the ‘Digidhan’ campaign which aims to spread awareness about digital transactions. 1. Government today informed Parliament that a decision has been taken to print plastic currency notes and procurement of material has started. 2. The Reserve Bank for long has been planning to launch plastic currency note after field trials. 3. In February 2014, the government had informed Parliament that one billion plastic notes of Rs. 10 denomination would be introduced in a field trial in five cities selected for their geographical and climatic diversity. The selected cities were Kochi, Mysore, Jaipur, Shimla and Bhubaneswar. 4. Plastic notes have an average life span of about five years and are difficult to imitate. Also, currency notes made of plastic are cleaner than paper ones. Such notes were first introduced in Australia to safeguard against counterfeiting. 1. The Rajasthan High Court has scrapped the Rajasthan Special Backward Classes (SBC) Reservation Act, 2015 that provided 5% quota to five communities, including Gujjars in jobs and education. 2. The verdict was given on bunch of writ petitions challenging the 2015 Act on grounds of violation of Supreme Court mandated limit of 50% on reservation. 1. The Human Rights Day is observed annually on 10th December to commemorate the Universal Declaration of Human Rights. 2. Observance of the day seeks to encourage, support and amplify measures to be taken by everyone to defend human rights. 2. “Stand up for someone’s rights today”. It aims to re-emphasise how important it is to live in peace and harmony, compassion and concern for each other’s rights with respect towards the idea of mutual co-existence. 1. The Parliamentary Standing Committee on Law and Justice, has called for transparency in the appointments process on the part of the judiciary and the government. 2. The committee was headed by Deputy Leader of the Opposition (Rajya Sabha), Anand Sharma. It has examined delay in filling vacancies in Supreme Court and High Courts. It has tabled its report in the Rajya Sabha and now it is under the purview of the Union Law Ministry.